The leader of the Mainstream of APC in Delta State Olorogun O’tega Emerhor has reacted to the recent interview by Senator Ovie Omo-Agege describing the embattled Senator as a drowning man grabbing at straws to hang on to his political life. He stated that Omo-Agege is the real cancer that invaded and ravaged the body politics of Delta APC and predicts that now that he has accomplished his task of distabilizing the party and making it fail in the 2019 general elections, Omo-Agege will soon head back to the PDP, his natural home. Delta APC has known no peace since Omo-Agege was welcomed by Emerhor to the party in 2017. Omo-Agege who used the Labor party to fight President Buhari and APC in the 2015 general elections was magnanimously admitted into APC in 2017. Omo-Agege upon joining APC kept his group of labor party joiners intact and later transformed it into the Ogboru/Agege faction of today Delta APC. Omo-Agege’s plan from day one was to ride on the back of Chief Great Ogboru to return back to the senate. He set about this by promising Chief Ogboru of making him Delta State governor in 2019. 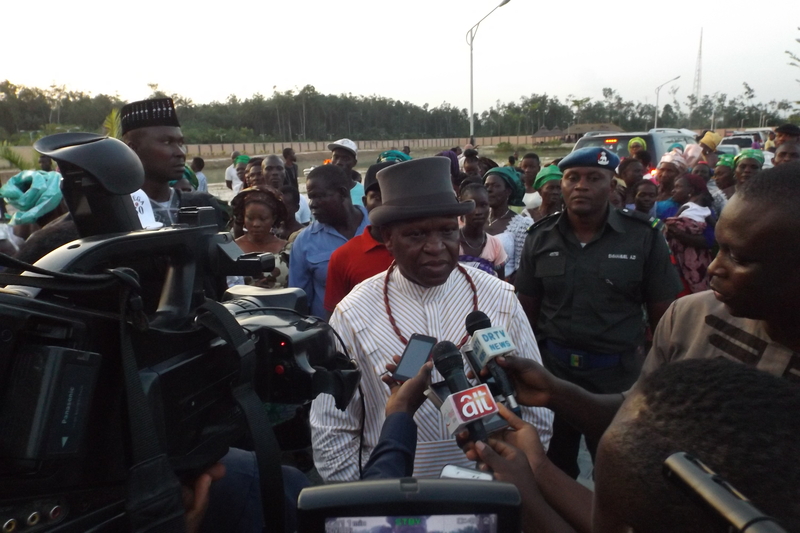 Against the run of play of equity and political reality, Omo-Agege sold this dummy to Chief Ogboru that power rotation and zoning in Delta State do not matter, that the Delta North do not deserve to complete their 8 years, that it does not matter, that without the inputs and cooperation of Delta North or South, only the Urhobos of Delta Central can make Ogboru governor of Delta state. Despite the well laid out plan of the Mainstream of the APC which properly positioned over 4 strong Delta North candidates in the person’s of Prof Pat Utomi, Hon Victor Ochei, Dr Cairo Ojougbo and Dr Leroy Edozien, to fly the APC flag and deliver the party in the 2019 elections, Senator Omo-Agege succeeded in turning the National APC against the APC mainstream in Delta and had his way to foist Ogboru and himself on the party. Now the verdict of abysmal failure is out and Omo-Agege is out there shamelessly attempting to pass the buck. Omo-Agege ended up making Ogboru a laughing stock. Out of 8 Delta Central LGAs, Ogboru managed to scrape through in only 2, and out of the 2, Ughelli north was substantially delivered by Olorogun O’tega Emerhor and Engr Sam Adjogbe. Emerhor and Adjogbe also delivered the 2 house of assembly candidates from their constituency out of only 3 races won by APC in Delta State in the 2019 elections. Ogboru lost all 9 LGAs and 8 LGAs in Delta North and South respectively. Omo-Agege was no where to be found! Omo-Agege instead of making Ogboru governor actually sabotaged him after purportedly winning his senatorial bid. How else do you explain Omo-Agege pulling in over 10,000 votes for himself from his Orogun ward 1 in the Senatorial elections of February 23 yet on March 9, in the Governorship elections of Ogboru, that same ward recorded under 2,000 votes only? Omo-Agege not only sabotage Ogboru and the APC during the governorship elections, he undermined the so-called federal might under his charge to fail Ogboru in a deal with PDP. Omo-Agege selfishly used and dump Ogboru while the chances of Delta APC. Omo-Agege picked an inexplicable fight with Evwreni ward 8, the ward of Olorogun O’tega Emerhor and Engr Adjogbe. Omo-Agege not only ensured his constituency projects never got to Evwreni but just before the elections picked a personal fight with the King of Evwreni. He maliciously lied against the King of stopping him from campaigning in Evwreni and arrogantly accused the whole ward of hating APC. It took Emerhor and Adjogbe to get Evwreni ward to vote APC in the Presidential and Governorship elections yet Omo-Agege who nearly destroyed APC in Evwreni is out there beating his chest for his sabotage. Omo-Agege is still delusional as the roof of his senatorial and deputy senate president ambition comes down crashing. He is acting like the proverbial drowning man grabbing at any straw in sight in an attempt to sustain his political life. Agreed he is a lawyer, he has also now decided to play court and judge over the annulment of his illegal candidacy in the 2019 elections. Three courts have passed judgments on the nullification of Omo-Agege’s candidacy: Asaba FHC judgement on March 18th by Justice Adegoke annulled the list of candidates that include Omo-Agege. The Asaba FHC judgement by Justice Dimgba on April 4th affirmed the annulment. The Warri FHC judgement of April 2nd struck out the suit by Emerhor and Niboro against INEC and APC for not joining Omo-Agege. The court found that APC’s assertion that Omo-Agege was a candidate that emerged from a primary monitored by INEC was not controverted and the court accepted the argument that Omo-Agege ought to be made a party to the suit. The Judge therefore struck the case out for failure to join Omo-Agege as a party to the suit. That did not amount to affirming Omo-Agege as the candidate as Omo-Agege is out there deluding himself and lying and deceiving the public. Moreover, the Asaba FHC judgement by Justice Dimgba on April 4th affirming Omo-Agege’s annulment is the last in time. Omo-Agege at first based his claim of remaining Senator-elect on the fraudulent and contentious Abuja FHC consent judgement stating that the Asaba FHC being a court of coordinate jurisdiction cannot supercede the consent judgement. Now he has moved away from consent judgement to Warri FHC that gave no order but struck out a suit for not including him as a party. The same Omo-Agege that is now chanting ‘no one can shave his head behind his back’ was the apostle of a consent judgement that shaved Chief Ogodo Exco and Emerhor and all mainstream candidates behind their backs with the Abuja FHC consent judgement and was proud of it. Just that the tables have now turned. Omo-Agege should tell Tonye Cole, Magnus Abe, the Zamfara candidates that because they were not sued individually, they were not impacted by the judgements of the courts that affected the list of candidates that included them. Omo-Agege like everyone else is not an independent candidate. They are all sponsored by the party. Once the list by the party is defective, Omo-Agege and all others are affected. Omo-Agege as a lawyer knows this. He is just delusional and or being mischievous. Omo-Agege never helped Engr Adjogbe to become Executive director NDDC. In fact since Engr Adjogbe’s appointment, Omo-Agege has continued to sponsor petitions upon petitions in an attempt to remove the EDP and sponsor his own candidate. Omo-Agege sponsored and controls the Executive Directors finance and projects in the Niger Delta River Basin Authority NDRBA and controls all contract awards in that authority yet he wants to acquire the NDDC as well. His hatred for Emerhor and Adjogbe is simply because he wants to control NDDC contracts. Emerhor and Adjogbe do not hate Omo-Agege. Emerhor open APC doors in 2017 to admit Omo-Agege. Omo-Agege has turned into the Cancer in Delta APC, a virus that has ravaged Delta APC body politics. Emerhor only seeks the restitution of the rights of mainstream APC through the courts and so far so good. Emerhor awaits the issuance of his Certificate of Return as Senator-elect from INEC. Emerhor will represent Delta Central as Senator and shall surely turn around the fortune of Delta APC in preparation for 2023 politics unlike Omo-Agege who is already negotiating his way back to PDP to actualize his 2023 governorship ambition”, the statement concluded.